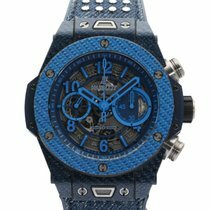 Hublot King Power Unico Italia Independent Blue. 411.YL.5190.NR.ITI15. HUB1242 UNICO Limited Edition of 500. Manufacture automatic chronograph flyback movement with column wheel. 45mm Carbon Fiber and Dark Blue Texalium. Mat dark blue skeleton dial with blue Azure counters and blue Azure hands with dark blue luminescent. Functions include 60 minute and small second sub dials, and chronograph centre sweep. 72 Hours power reserve. Dark blue rubber and genuine blue jeans strap with silver studs with folding clasp. Box and papers.